Most people understand the importance of routinely brushing their teeth. However, you’d be surprised (or maybe not) at how many people skip the flossing step of their homecare regimen. Some patients say that flossing is something that they just didn’t grow up doing, others simply don’t see a reason to do it. However, flossing is SO important, and can make a major impact on your mouth and your health. Read on to learn about why you should floss on the regular. So, what if you don’t floss, and don’t plan on starting anytime soon? You could be on your way to a dangerous snowball of disease. Patients who don’t floss are at a higher risk for developing gingivitis, cavities, and even periodontitis. 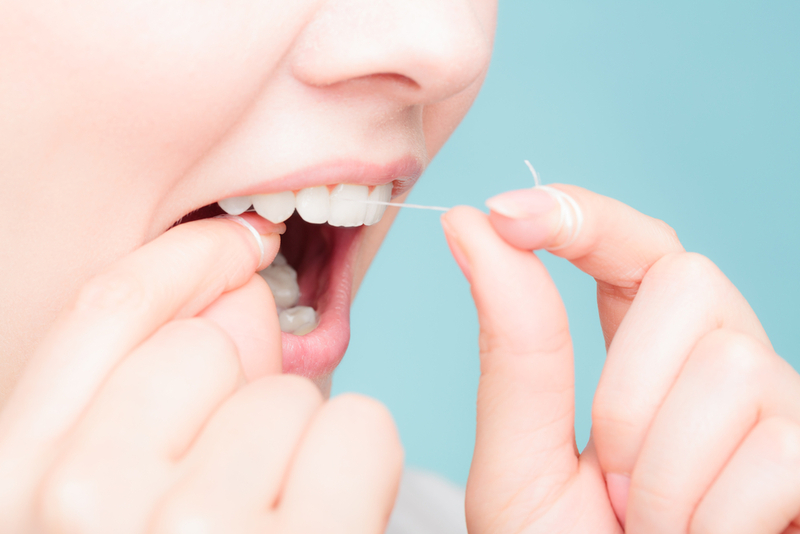 Because flossing helps to remove dental plaque buildup from between the teeth, those who skip this step are allowing this plaque to irritate their gum tissue. Cavities are also more likely to form between your teeth, since dental plaque can cause bacteria to grow and destroy the enamel in these areas. If left untreated, gingivitis can lead to periodontal disease. The bacteria from this disease can then enter the bloodstream, leading to more serious health issues. As you can see, flossing is an important step of your oral hygiene routine that can help keep your mouth and your body healthy. In order to benefit from flossing, individuals should floss at least once a day, especially before bed to remove any plaque that has built up during the day. I’m partial to Cocofloss myself (we’ll give you a sample in our office—it’s amazing!) but any waxed floss is recommended, so that it can easily glide between teeth. Also, don’t forget to brush at least twice a day! If you’re not a flossing regular, now’s the time to start! And if you need a little motivation to jump-start your new routine, give us a call today! We’d be happy to schedule an appointment for you, and answer any questions about flossing and/or other home care routines you may have! For more information, visit our blog page.